Fortunately for modern women as a contraceptive method that isnow more diverse, effective, low dose and have additional benefits.One of hormonal contraceptives have the added benefit is a pillcontaining the progestin drospirenone that has a profile very similar to natural progesterone. 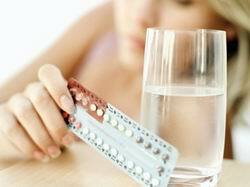 second-generation contraceptive pill have a lower level of hormone pills first generation to be more secure. Pills containing progestin drospirenone also has an effect and antimeneralokortikoid antiandrogenik. With these properties, these contraceptives provide additional benefits that do not increase body weight, overcome the problem of menstrual pain, reduce the risk of anemia, and even prevent some types of cancer. “The content of hormones in the pill that more viscous cervical lymph to prevent the entry of sperm. But it seems that the inclination not only sperm can not enter, but also the germs and bacteria that cause infection,” said Prof.dr . Biran Affandi, Sp.OG, Chairman of the Board Contraception Asia and the Pacific (APCOC) in celebration of World Contraception Day in Jakarta (23 / 9). However, the contraceptive pill should be given a doctor’s prescription because not all women are allowed to consume this pill.Women smokers and aged over 35 years, a woman who has particularly high blood pressure, diabetes mellitus, impaired liver orliver cancer, and who have a history of breast cancer is not recommended to use the contraceptive pill.